This page is intended for college students and high school students who are studying calculus. For younger students, a simpler explanation of the information on this page is available on the Kids Page. For high school and middle school students there is another version without calculus. Sir Isaac Newton first presented his three laws of motion in the "Principia Mathematica Philosophiae Naturalis" in 1686. His second law defines a force to be equal to the change in momentum with a change in time. Momentum is defined to be the mass m of an object times its velocity V.
This differential equation can be solved with the boundary conditions that we described above assuming that we know the variation of the force F as a function of time. Remember that this relation is only good for objects that have a constant mass. This equation tells us that an object subjected to an external force will accelerate and that the amount of the acceleration is proportional to the size of the force. The amount of acceleration is also inversely proportional to the mass of the object; for equal forces, a heavier object will experience less acceeration than a lighter object. Considering the momentum equation, a force causes a change in velocity; and likewise, a change in velocity generates a force. The equation works both ways. The velocity, force, acceleration, and momentum have both a magnitude and a direction associated with them. Scientists and mathematicians call this a vector quantity. The equations shown here are actually vector equations and can be applied in each of the component directions. We have only looked at one direction, and, in general, an object moves in all three directions (up-down, left-right, forward-back). 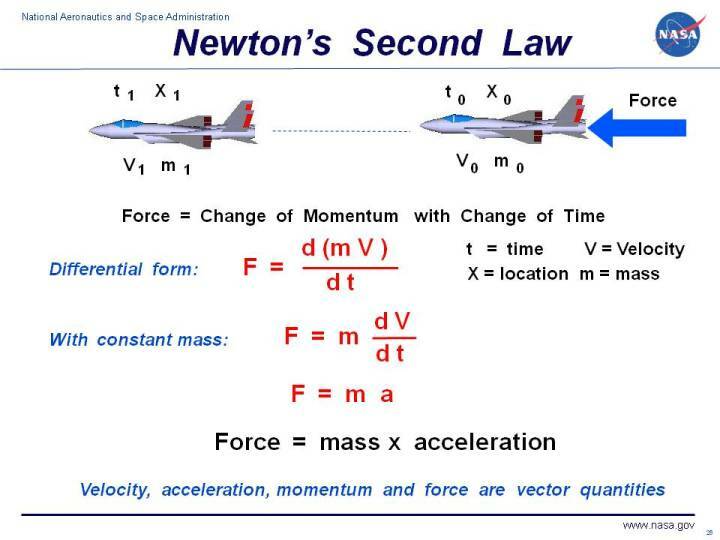 The motion of an aircraft resulting from aerodynamic forces, aircraft weight, and thrust can be computed by using the second law of motion. But there is a fundamental problem when dealing with aerodynamic forces. The aerodynamic forces depend on the square of the velocity. So integrating the differential equations becomes a bit more complicated. We show the details of the integration at the web page on flight equations with drag.